TESLA FACTORY TRAINED in 2012, 2013, 2014, 2015, and 2016. We've had a relationship with Tesla Motors since 2010, when we undertook the repair of the first Tesla Roadsters at our New York City shop... and the rest, as they say, is history. We were invited by Tesla to train with their team in Fremont to become a Tesla-certified body shop. This intensive, first-hand training allows Precision Auto Works' aluminum vehicle repair team to properly repair and restore your Tesla vehicle to original factory specifications. utilize the original tooling mandated during the certification program's inception. Shops certified after 2016 are no longer held to these same exacting standards. In fact, the newly certified shops have only received "online training" and are not required to use the same tooling that we use. As a result, the quality of repairs by the newly certified shops and the integrity of your vehicle will suffer. Demand the best for your safety and your investment: choose Precision Auto Works of LIC for all your Tesla collision repairs! Since 1996, all our work is guaranteed. INSURANCE QUESTIONS? We accept all major insurance plans plus specialty plans like Pure, AIG, Cincinnati and Zurich! We're dedicated to helping you get the best results from your insurance company. 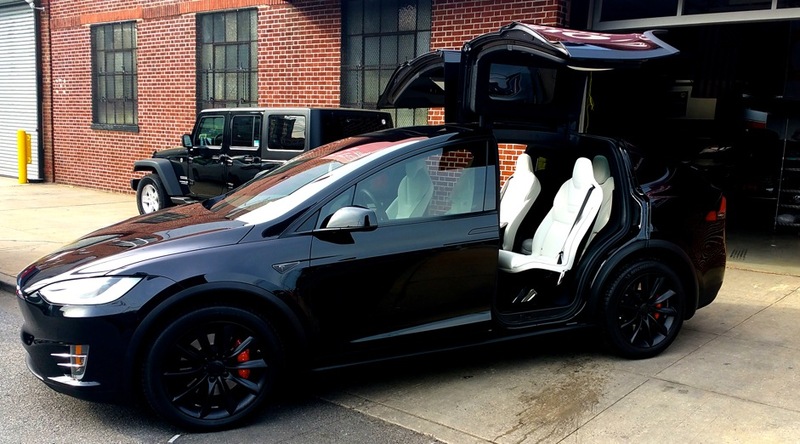 So bring your Model X, Model S and Model 3 for exceptional quality and customer care. 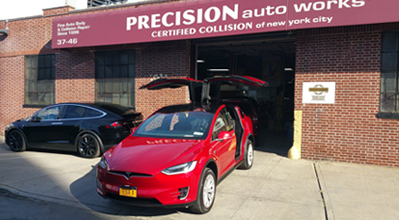 Over 1,000 Tesla vehicles flawlessly repaired at Precision Auto Works of LIC. then choose Precision Auto Works of LIC™ with confidence: ALL OUR WORK is guaranteed! 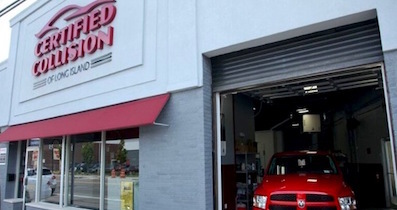 Precision Auto Works of Long Island City™ has the experience, certifications, training AND specialized equipment required for exceptional quality repair of ALL your vehicles. We are proud to be BMW, VOLKSWAGEN, and TESLA Factory Trained, an I-CAR GOLD CLASS collision shop, and certified by: ACURA / HONDA, CADILLAC, FIAT / JEEP / DODGE / CHRYSLER, INFINITI / NISSAN, with unmatched experience and expertise in the repair of luxury vehicles like: ALFA ROMEO, AUDI, JAGUAR, LAND ROVER-RANGE ROVER, LEXUS, MASERATI, MERCEDES-BENZ, PORSCHE, & more! SATURDAY: 8am - 3pm. Closed SUNDAY. HOURS: WEEKDAYS: 8am-5pm. SATURDAY: 8am - 3pm. Closed SUNDAY.